Contemporary spin on rustic charm. This plank top table will be adored by all. Casual sophistication is the idea of this versatile dining set. The Bardstown chairs are exquisite pieces on their own featuring a ladderback style and faux leather padded seating for extra comfort. Contemporary spin on rustic charm. This plank top table will be adored by all. Casual sophistication is the idea of this versatile dining set. Add in the faux leather bench to this set and you not only optimize additional seating but add a new dimension to your look. 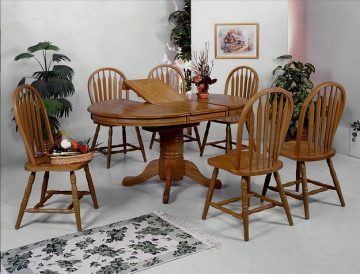 The Bardstown Dining Set includes one counter height table and four counter height chairs. The Bardstown is a great addition to any space that can be dressed up or down. It features a rectangular table and thick slatted ladder back seats with faux leather seat padding. Enjoy the Bardstown dining table in your home today. The Bardstown table, chairs and bench are also offered in a standard size.